I spent 10 years trying to get pregnant unsuccessfully. So, we applied for adoption. I just found out we’ve been approved and we’re flying to pick up our new son next week. So, now I’m in a mad dash of preparation for my new son. I can’t believe I can say my son. I want to do everything right. He’ll be 5 soon. What age should he start seeing a dentist? At what age should I switch him to a regular dentist? The first thing I want you to do is to take a deep breath. This is a tremendous moment for you and I know you must feel thrilled and terrified simultaneously. I also don’t want you to get disappointed by unrealistic expectations. I know you want to do everything perfectly, but like everyone else, you’re human. You’re going to make mistakes. You’ll make incredible sacrifices for your son, but you’ll also have selfish moments you’ll feel bad about the moment it’s done. Don’t beat yourself up about it too much. Just learn from it and move on. As for what age he should see a pediatric dentist, I’d start him immediately, especially if he hasn’t been much in the past. Too many parents wait until there’s a dental problem and they need an emergency appointment. Then, the child’s first experience with the dentist is a negative one. You can take him to a pediatric dentist or a general dentist who enjoys working with children. Both are qualified. Both have their pros and cons. 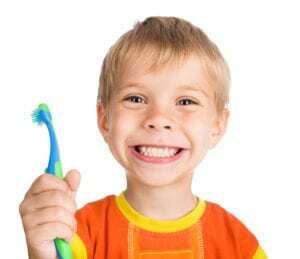 A true pediatric dentist has done extra schooling and can handle certain more unusual issues that come up with children but not on adults very often. Additionally, their office is designed for children with little chairs and lots of colorful walls and toys. They usually go into the field because they love children and are great working with them. A general dentist is still qualified to treat children, but have not had the additional schooling. That means there could be a tricky issue come up where they’d have to give you a referral to a specialist. However, that happens no matter what field someone is in. Many parents find it convenient for the entire family to go to the same practice. Though their office isn’t always designed with children in mind, if they enjoy treating children they will have things on hand for them. When your son is with a general dentist, there won’t be any worries about having to switch dentists when he reaches a certain age. He’ll already be with a “grown-up” dentist. I hope this helps and congratulations on being a mom.